"Where do I go from here?" It’s a question frequently asked by family historians when a roadblock, crossroad or dead end hiccups their genealogical research. 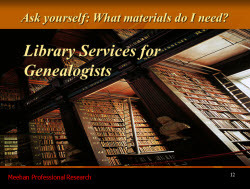 Often overlooked by genealogists, this presentation introduces basic genealogy resources found at libraries. Learn how to navigate local and overseas library catalogues, discover print sources, take a virtual tour of a library’s electronic genealogical tools, and find out about other services public libraries can offer the genealogist.